The Mars Volta keyboardist/percussionist Marcel Rodríguez-López has had some extra time on his hands since the prog band called it quits earlier this year, and he's used it to prep a solo LP under the name Eureka the Butcher. The project's debut disc, Music for Mothers, arrives May 28 via Rodriguez Lopez Productions/Sargent House. According to a press release, the 11-song set is quite personal, and is dedicated to Rodríguez-López's mother, Frances Sarah Rodríguez-López, who passed away in 2012. "This record is for my mom because she is the reason why I started playing the piano," the multi-instrumentalist said in a statement. "She told me that it was great that I wanted to play drums, but if I played the piano, I could create music and play to a room full of people by myself. I didn't start playing drums for another four years, and I wouldn't start playing piano for another seven or so." He added: "My mom is my biggest fan and she gave me the drive, confidence, and clarity to start and finish this album." The songs were written while on the road with the Mars Volta and Marcel's other act Zechs Marquise, in which he plays drums. Apparently the tracks were crafted "in buses, vans, planes, dressing rooms, airports, hotel rooms, backyards, sidewalks, just about everywhere." The beat-driven project mixes electronic elements with "a handful of instruments" Rodríguez-López learned how to play for the record. Live, Rodríguez-López is joined by Sadah Luna. Opening number "Here Comes Eureka B," which is slathered in mad-scientist synths, pitter-pattering percussive notes and a slow-mo beat, can be streamed down below. 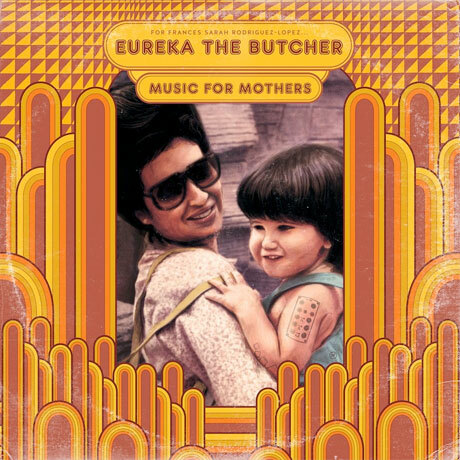 Eureka the Butcher "Barbeque at Channel One"